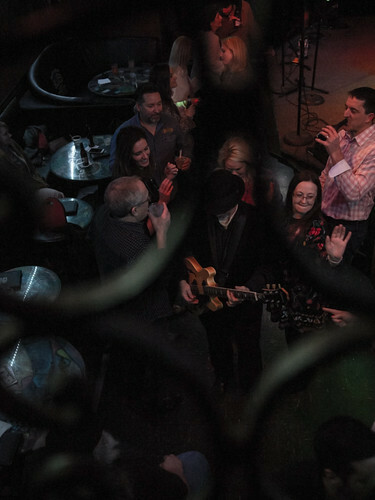 As seen through the balcony balustrade, concert-goers (and beer drinkers) gather round Cincinnati, Ohio-born blues guitarist/vocalist Stacy Mitchhart during his performance at Bourbon Street Blues and Boogie Bar, in the Printer's Alley district of Nashville, Tennessee, on 2 February 2018. In 2003, Mitchhart received the 'Albert King Most Promising Guitarist Award' at the Blues Foundation's International Challenge, in Memphis, Tennessee and has won a Grammy and been nominated for two more, according to Wikipedia. More pictures from the performance: here.